This is such a fun project to do with kids … just make sure you hide your ‘best’ buttons before you let them loose on your stash! Prepare the ball ~ Cover your polystyrene ball with double-sided tape, working from top to bottom around the ball to keep it as flat as possible. (It’s probably best to prepare this beforehand, as it could get very fiddly and sticky!) Prepare the hanger ~ Cover your eye hook with yarn to hide the metal (or if you don’t have an eye hook simply use a screw to attach the ribbon to) and screw into the polystyrene ball. Get out the glitter and glue! ~ Yep, the kids love it! To give your bauble a bit more sparkle, mix some glue & glitter and start painting! Fill any gaps between buttons with glue then sprinkle over some glitter. Then use your mixed glue & glitter to lightly cover the buttons. * note - Diamond Glaze works well as it gives a lovely high gloss finish, but a mix of pva glue with glitter will give a similar effect. Attach the ribbon and hang! 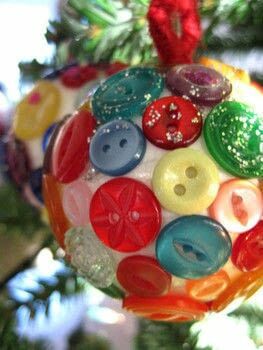 ~ … Now sit back and admire all those lovely buttons sparkling in the tree!